Debisi Araba is an environmental policy and strategy specialist. He is the Regional Director for Africa at the CGIAR’s International Center for Tropical Agriculture (CIAT). He was a Louis Bacon Environmental Leadership Fellow in the mid-career Master of Public Administration Program at the Harvard University Kennedy School of Government. He was previously the Technical Adviser on Environmental Policy to the Honorable Minister of Agriculture and Rural Development in Nigeria. He was also the Team Leader of the Environment and Climate Change Unit in the Ministry. His present focus is on agricultural resilience and he recently co-authored Nigeria’s National Agricultural Resilience Framework. He additionally leads the development of climate smart strategies for the agriculture sector. 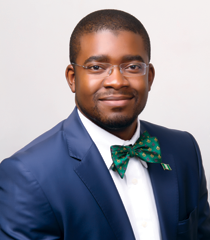 Dr. Araba began his professional career with the Newcastle City Council in the United Kingdom, where he worked as a consultant and Project Manager on waste recycling and environmental policy. He also worked at the African Development Bank with the Gender, Climate Change and Sustainability Unit where he provided policy advice and designed Technical Assistance Programs on carbon financing. Dr. Araba is a respected and published academic who has presented his work at various conferences worldwide. He is a Fellow of the Royal Geographic Society and a member of the Nigerian Society of Engineers, International Solid Wastes Association and the Collaborative Working Group on Solid Waste Management in Low and Middle Income Countries. Dr. Araba holds a Bachelor of Science (BSc) degree in Physical Geography, a Master of Science (MSc) degree in Clean Technology from the University of Newcastle Upon Tyne, and a Doctorate degree (with best thesis) from the Centre for Environmental Policy, Imperial College London, UK, where his research focused on designing frameworks for incorporating evidence-based research into environmental policy in developing countries.